1. Longitudinal section of the Church of St. Andrew at Manuta, commenced in 1472 from the designs of Leon Baptista Alberti, and terminated after his death, which happened the same year. The transepts were not completed till 1600, and the dome is the work of Philip Juvara in 1732. 2. Transverse section through the transepts. 3. Plan of the Church of St. Andrew; the form of the Latin cross, the regular distribution of the chapels, the entrances to which form the decoration of the nave, have been often imitated, and this church has in fact served as a model to many others since erected. 4. Elevation of the entrance vestibule. 5. Details of the Corinthian order decorating the entrance vestibule. 6. Details of one of the fluted pilasters supporting the central arch of the façade of the vestibule, no. 4. 7. Cornice of the principal door to the church under the vestibule. 8. Console, serving as key-stone of the center arch of vestibule. 9. 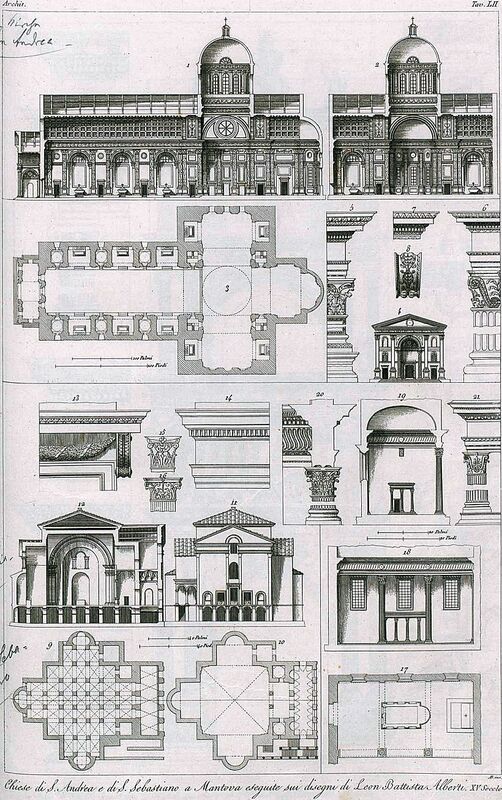 Plan of lower story of the Church of St. Sebastian at Manuta, erected from the designs of Leon Baptista Alberti. 10. Plan of the upper story, presenting the form of the Greek cross. 12. Section of the same church. 13. Detail of the architrave of the external doorway, with the freize and cornice. 14. Profile of the entablature, terminating the principal façade of the church. 15. Capital of an antique pilaster, found in the Villa Adriani near Tivoli. 16. Another capital from the pilasters of the Arch of Ardian at Athens; these capitals are placed here to show their analogy with that employed by Alberti in the Chapel Rucellai, engraved no. 21. 17. Plan of the chapel of the family of Rucellai in the Church of S. Pancrazio at Florence, built by Leon Baptista Alberti in 1467, for Jean Rucellai, in the center is the plan of the Holy Sepulchre, constructed by him after the model of that which is at Jerusalem. 18. Façade of the Chapel Rucellai, towards the nave of S. Pancrazio. 20. Base, capital, and profile of the entablature of the two Corinthian columns which decorate the entrance to the chapel; the freize of this entablature is ornamented with twisted flutings, a kind of ornament often employed by Alberti and Brunelleschi. 21. Details of the order which decorates the Holy Sepulchre in the center of the chapel: the exterior of this small temple is covered with precious marbles, in compartments arranged by Alberti.